April 26 marked the 121st anniversary of the Department of Medicine as established by the Board of Regents, which included the College of Medicine and Surgery and Dentistry. Although the original charter for the University of Minnesota listed a medical school as a component of the University, it was not formally opened until 1888. I was once told that in the minds of most people, history begins the day before you were born. All other things that happen during the course of your life seem like current events because you experienced them one way or another. It can be curious then to see how others celebrated their own lived history long before present day. The book below is one such example. 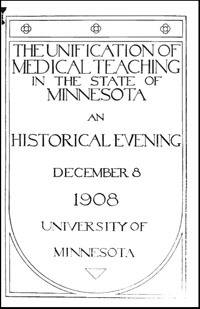 It is a collection of essays documenting the history of medical education in Minnesota from the mid nineteenth century up until 1908. The first 20 years of the Medical School takes center stage and the essays are presented primarily by the individuals who formulated its organization. The book concludes with a look forward and to three primary needs for medical education in Minnesota: the addition of hospital & laboratory space; better cooperation with state institutions; and ways to diffuse medical knowledge to physicians & the public. Before reading the book, consider the fact that more than 85% of the history of the Medical School has taken place since this historical evening. How will your life’s experiences fit into someone else’s history?